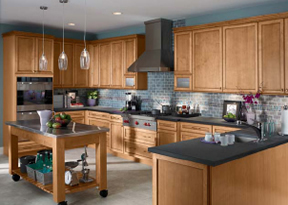 Getting Started On Your Remodel | MTKC - MT Kitchen Cabinets, Inc. San Mateo, California. Remodeling! What an exciting thought! “I’m going to have a new kitchen, a new bathroom, new cabinets in the dining room, new everything!” Then somewhere along the line, you become too distracted by everything else that goes on in life: work, kids, vacations, and visiting family. And next thing you know, it has been a year since you started planning your project. You haven’t gotten anywhere, you realize, because you don’t have enough time to do everything. Then the project suddenly seems a lot more time-consuming and stressful. Remodeling is definitely an exciting idea. However, the remodeling process itself can be a bit stressful and troublesome due to the many variables in budgeting, planning, design, and construction. To get started, many folks like to hire a cabinetry designer or a general contractor. Choosing an experienced and knowledgeable designer will definitely lighten your load, but there are also some simple steps that you and your family can take to make the remodeling transition a smoother and more enjoyable process. Budgeting : Today’s market offers a wide variety of products with basic functions and features. But prices can differ significantly, depending on types of material, levels of quality and craftsmanship, sizes, additional features, and brand. It is not uncommon to see people choosing among options where the price of one is two to three times that of another. Essentially, it boils down to what you want. Having an honest and realistic budget will allow for more accurate planning and help guide your decisions. Also, discuss with your family what scale of remodeling is best suited to your home. Planning : Prior to working with your designer, determine which styles and colors you like. It helps to flip through magazines and visit a showroom to learn more about available products. You may want to visit model homes, or even the homes of your friends and family, just to see what others have done. Once you have an idea of how you want your room to look, the design process is much easier. Measuring : Every inch matters; therefore, it is important to have a professional double check your measurements before ordering cabinets or appliances. To get started, take some measurements, just so you have something to accompany the sketches or photos you’ll give to your designer. Providing accurate room measurements will work to your advantage, making your plans more precise. Remember to note the locations of windows and doors, as well as ceiling heights and any other obstacles in the plan. Choosing Appliances : Including the size of your sink and appliances is also very important. If you plan to install new sinks or appliances along with your new cabinets, you may either provide the new sizes or have your cabinetry designer choose for you. With accurate appliance measurements, you can make the most of available space. Lastly, try not to feel stressed. Enjoy the process. With the above four pieces of the puzzle in place, the rest will easily follow, and you will soon be looking at your newly remodeled home. The above content was published in Home Digest Magazine in July 2006. For reference to the actual copy, please download this pdf file.